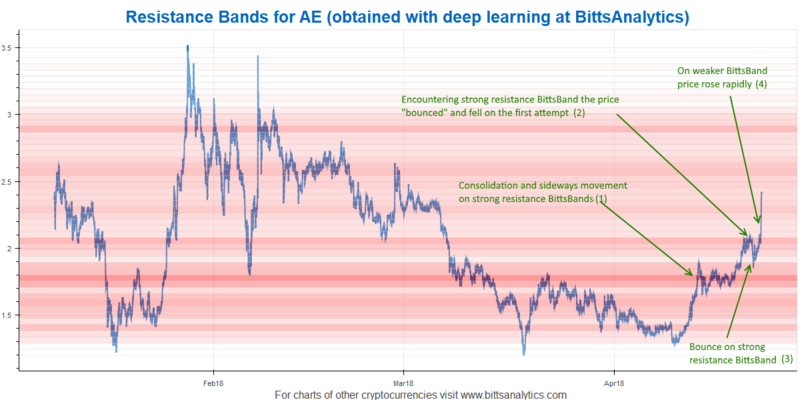 We are using deep learning on vast sets of different data to assess where could be possible price bands of resistance for cryptocurrencies. Let us explain how users of our platform can use our BittsBands for better anticipating possible price paths. We will use Aeternity price movements in the last days as an example. 2. or that it will be “repelled” by the band downwards when approaching the band from below or consolidate within the band afterwards (see point 2). If the band is particularly weak, i.e. almost white, then there is a higher probability of price rapidly moving through such price band. This has indeed happened in the last few days (see point 4 in the chart). There were very weak bands above 2.1 USD and the price then quickly rallied for a return of more than 20%. Of course not every price movement will follow this pattern as often there are other drivers, e.g.. fundamental ones but even in those cases we often see effects as described above. We regard BittsBands as one the best analytical tools on our platform. If you want to include these deep learned data in your cryptocurrency analysis you can find it at our BittsAnalytics platform: www.bittsanalytics.com.. Platform also has a lot of other advanced data such as social media analytics and chart patterns automatically detected with AI as well as sophisticated analytical tools.